A young woman is hurrying out of a dwelling with a sign on the door saying okashi zashiki (rooms to rent). 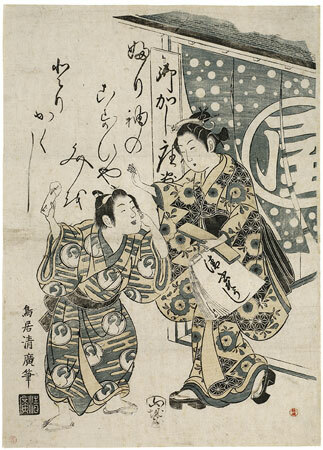 In her left hand she has a small packet of writing paper for poems and a calligraphic copybook (kiyogaki sōsho). She is attempting to recover a love letter from the boy who seems to have taken it. However, the boy only makes fun of her with an insubordinate gesture.